Specifically designed for standard conformal flex applications, the Cupracid® Flex process is for use in conveyorized systems with soluble anodes. For systems with insoluble anodes, InPro® Flex is the solution of choice. Both processes provide excellent pattern uniformity, as well as high throwing power and line shape, even at high current density and without any corner flattening. Both new processes consist of a simple two additive system and can be analyzed using CVS in fully automatic analysis and control system for easy maintenance. 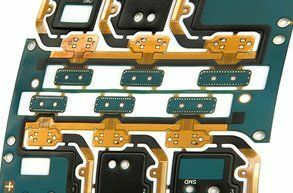 Printoganth® RA has been specifically developed to provide next generation flex and flex-rigid PCBs with excellent adhesion on exposed polyimide areas as well as a shiny surface appearance after electrolytic copper plating. The new horizontal electroless copper process is fully compatible to ED, RA and super flexible RA (HA) copper foils. It features an exceptional throwing power into BMVs, enabling excellent coverage on all critical areas including adhesive layers. Moreover, Printoganth® RA has a fully analyzable stabilizer system for best process control.